Hello! Due to popular demand, I will be posting two Fashion Posts a week instead of only one. I usually do a Fashion Over Fifty post on Fridays, so my second fashion post will be a mid-week one, on Wednesdays, unless a challenge or deadline bumps it to another day. I also want to keep my second fashion post more laid back; perhaps showing repeat outfits styled a different way (as in today's outfit), everyday wear (like what I would wear to go shopping at Target) and maybe some 'selfies', or just pictures I found on the web and a discussion of current fashion trends. Because of that, I won't be titling my mid-week Fashion Posts "Fashion Over Fifty". The sweater dress I'm wearing below you've actually seen before HERE. But I decided to feature it again because I have a lot of new readers that may have not seen it before, and I also wanted to show you how making just a few changes to an outfit can make a huge difference. 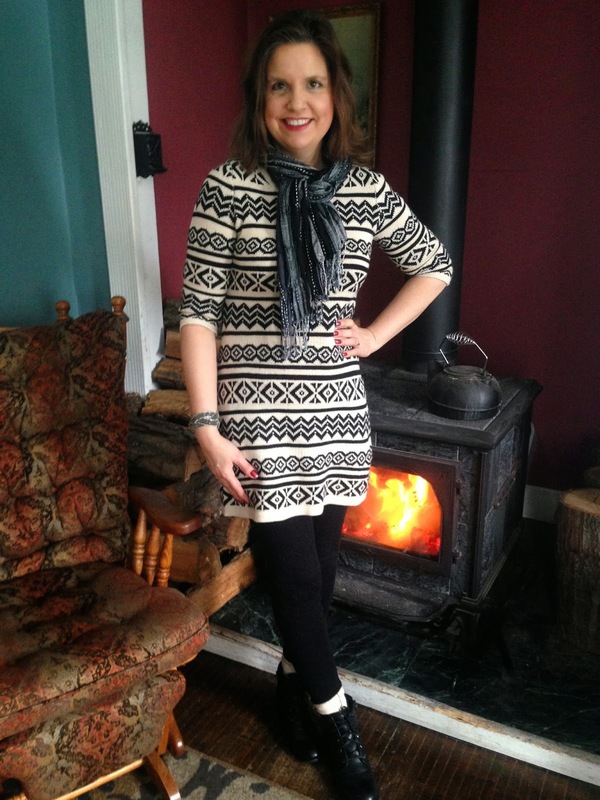 In the original picture I styled the dress with a solid black scarf, solid black leggings, and flats. 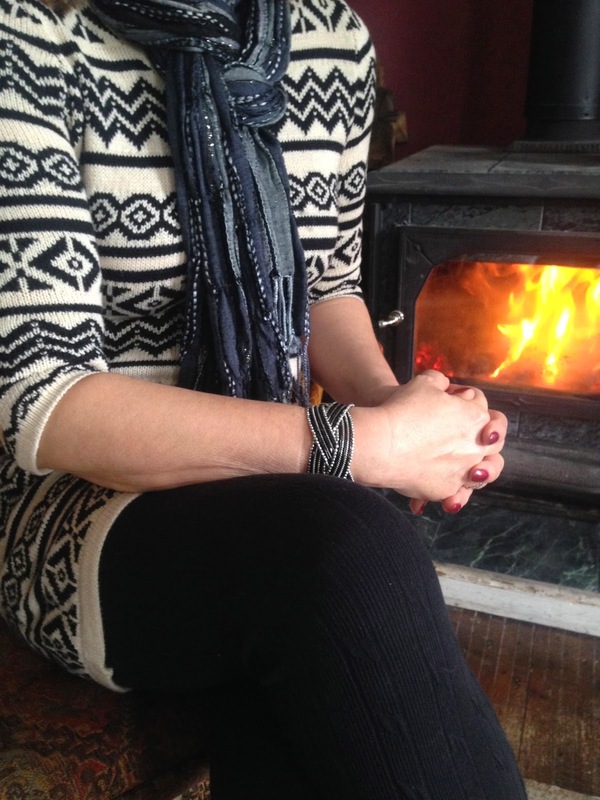 In this post, the biggest change I made was adding a scarf with a pattern to it. It's a very subtle change, but a more effective one than just using a solid black scarf. I really like the difference. You could even add a more dramatic change by introducing a scarf with a different color, but for some reason, even though I tried other colored scarves with this outfit, I really preferred sticking to black. I kept the same bracelet, but I changed the leggings. In the original post, I had the standard black leggings with a little zipper at the ankle. Because the dress was knit, I wanted to try a cable knit legging. I bought these at Sears on clearance for $3.59! Score! I know this is the time of the year when everyone buckles down and stops shopping, but it is also the best time of the year for some great deals! The stores are desperate to get rid of their winter merchandise to make room for their spring and summer items, so there are some extreme markdowns out there. The trick to taking advantage of these great prices and still staying in budget is to only buy what you need. Don't buy something just because it is a great price if you really don't need it. One of my favorite quotes is "You can save 100% by not buying it at all!" because so often we get tricked into purchases just because they are 'on sale.' I really needed new black leggings, because I actually got a run and a bleach stain, in the leggings I wore in my first post, so they obviously needed to be replaced. 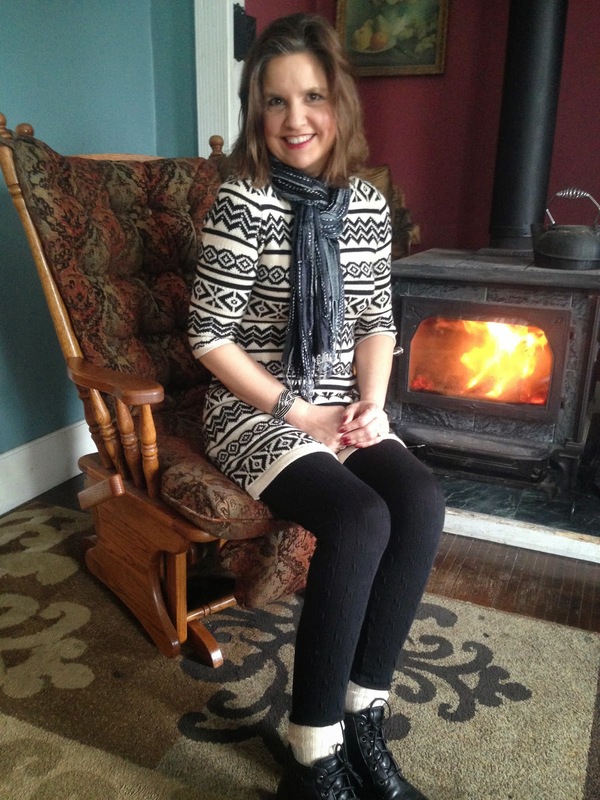 I think the cable knit leggings compliments the dress so much more than the plain leggings did. I love all the interest with the added texture and pattern. I would have loved to have found an off-white/beige cable knit legging to match the sweater instead of black, but all I found was white (I bought those too!). This photo that I found on Pinterest, was my inspiration for my outfit. I loved the different pattern in her scarf, and how she wore cable knit leggings with her sweater dress. I had hoped to mimic this look with off-white leggings for my outfit, but no luck! 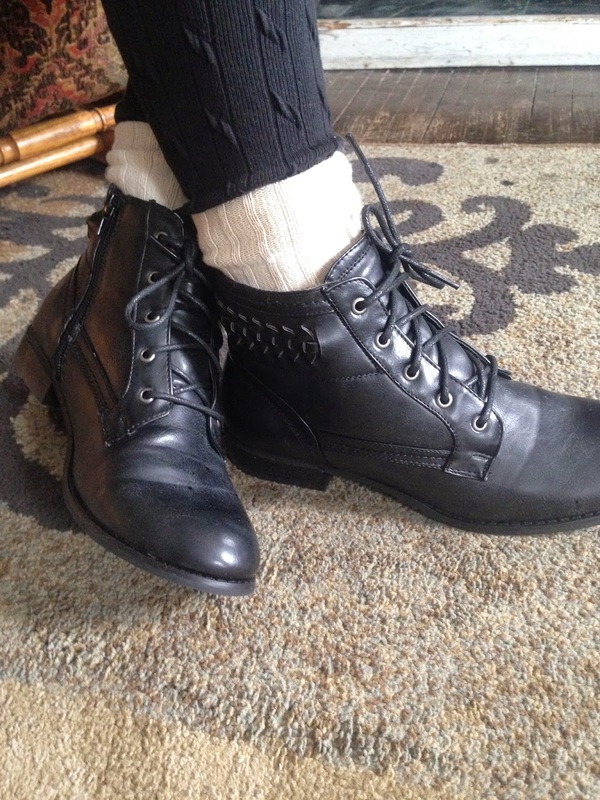 Like the inspiration photo, I wore black booties with socks for footwear. The booties are much more practical for winter's in Wisconsin than the flats I had on in my original post. They are made by Guess and I found them in a new store that opened up in our local mall called "Encore" for only $17.99 (originally $59.00). If you are lucky enough to have an "Encore" store in your area, consider yourself blessed! I have always purchased shoes at Famous Footwear, Macy's, or Younkers, but I think "Encore" will be become my main footwear shopping store now. They sell designer shoes at a fraction of the price of most other stores. They do not have a website, nor do they advertise, so I can't provide any link for you. My husband and I went shopping there on their opening day and we bought four pairs of designer shoes for under $100! To say we are thrilled with the place would be an understatement! As usual, I always look for details when I'm buying shoes. I loved that these booties both zipped and laced up. And I really love the braided leather trim on the sides and back of the shoe. I added off-white socks to break up the black of the leggings and the shoes. It would have been neat to add a sock with a pattern, just like in the inspiration photo, but I didn't have any. I really loved this warm and cozy outfit, but I tell you, it is a WARM outfit. I wore it on a bitter cold, snowy morning, and I was hot. The cable knit leggings are very warm, and the scarf was killing me ( I was under stage lights a lot that morning, so that was part of the problem). I wanted so badly to take the scarf off, but it would have ruined the look of the outfit, so I just suffered. Beauty before comfort (unless it comes to footwear! LOL!). It might be a more appropriate outfit to wear for an outdoor event rather than an indoor one. So what do you think? Do you like seeing repeat outfits styled in a different way? Which outfit do you like better? The original one or this one? I'd love to hear from you. Linking up to What Wives Wear. Great outfit, Amy! I really love the pattern on that dress. Also, the knit leggings does look so much better. Seems like you're having a lot of fun with these fashion posts. Keep it going! Have a wonderful day! I am excited to hear that you are bumping up your fashion posts to 2x a week because naturally, those are my favorites. :) I also love seeing how people wear their clothes in a different way because that's real life for most of us. We don't get an all-new outfit 5x a week! I don't think I have a favorite way you wore this sweater dress. I like both options! I love the length of this sweater and I also love those boots. I need to get a pair of shorter boots like that, which would style great with leggings!